This State Supports Legal Recreational Weed. So Why Is It Still Illegal? While the Governor fully supports the legalization of medical cannabis, he’s not convinced about recreational legalization. As Pennsylvania prepares to usher in its recently legalized medical cannabis policies, some believe the financially-unstable state should also consider recreational legalization to help offset their growing debt. After watching the benefits rise for states like Colorado and Oregon, taxing recreational cannabis has become a topic of consideration among many state legislatures. 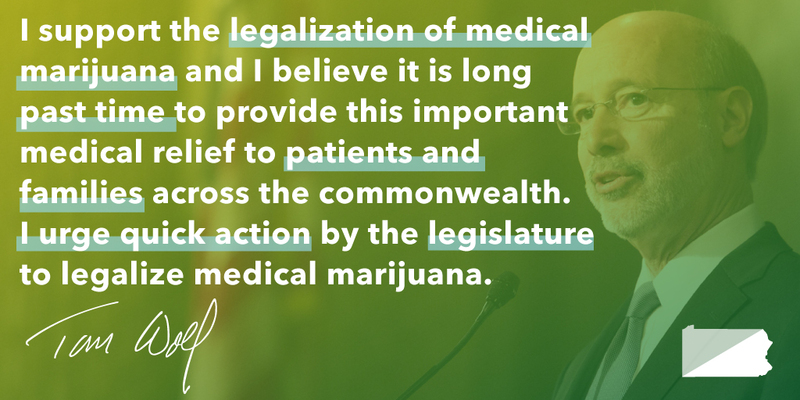 However, with so many gray areas still apparent within the legal recreational market, Governor Wolf doesn’t believe Pennsylvania is ready for such a momentous change just yet. Pennsylvania, like so many other states across the nation, is facing a $3 billion financial deficit in the state’s budget. These crippling numbers are leading to cuts in everything from grants for inner city schools to police forces being forced to reduce patrolmen and forego equipment updates. With so much uncertainty surrounding the debt, politicians are scrambling to find additional tax revenue to help slow the growing bill. The new medical cannabis market will likely bring in some additional funding, but with the program not expected to be operational until 2018, those gains will likely be seen long after the state has suffered some serious fiscal damages. Eugene Depasquale, Pennsylvania’s Auditor General, brought the idea of recreational legalization to the table in the form of a report. Depasquale estimated that by regulating and taxing recreational cannabis for adults 18 and over, the state could gain an additional $200 million in taxes. With many of Pennsylvania’s residents in favor of legalizing recreational cannabis, it’s likely the estimated tax revenue is on the conservative side. It didn’t take long for Pennsylvania Governor Tom Wolf to respond to Depasquale’s report. Last year, Wolf signed into law the state’s newly adopted medical cannabis policy, saying that patients deserve the right to medication without fear of prosecution. He has also supported the idea of decriminalizing possession of small amounts of cannabis, but as for full-blown legal recreational use, Governor Wolf is not ready to get behind that movement. I think Pennsylvania would do right to see what happens in Colorado, Oregon, Washington, some of the other states. States like Colorado, where recreational cannabis has been legal since 2014, have seen some of the highest tax revenues ever experienced in their state, thanks in large part to the higher-than-average taxes placed on legal cannabis sales. Each additional tax is distributed to a specified area, ensuring schools and public welfare reap the most benefits from the sales. While Wolf understands that states with recreational cannabis programs do gain more tax revenue, he believes the $200 million increase predicted by Depasquale’s report will do little to help the $3 billion debt Pennsylvania is facing. I saw the report. I haven’t talked to the auditor general. And I think he’s trying to be helpful in terms of the budget deficit. His calculation I think had it about $200 million. We have a $3 billion dollar deficit, so that’s not going to help. While a recreational cannabis market might not solve all of Pennsylvania’s financial woes, it would be a step in the right direction. Just like other states who have adopted recreational market, it’s likely, over time the revenue would continue to increase.